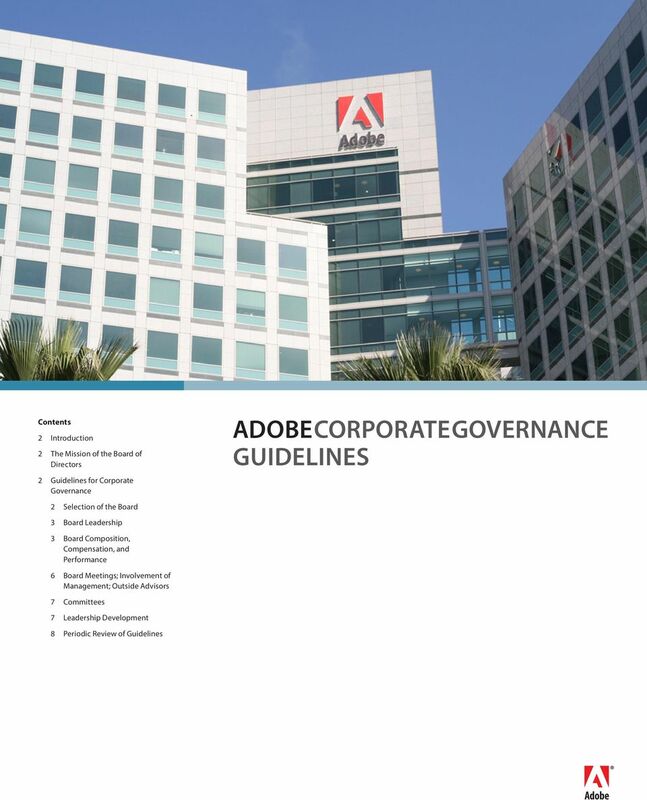 Download "ADOBE CORPORATE GOVERNANCE GUIDELINES"
5 Adobe Corporate Governance Guidelines 5 statement whether such nominee intends to tender an advance Resignation Letter in accordance with these Guidelines if they are elected, and to follow any other requirements set forth in the Company s Bylaws. The Nominating and Governance Committee will promptly consider the tendered resignation and recommend to the Board whether to accept or reject it. 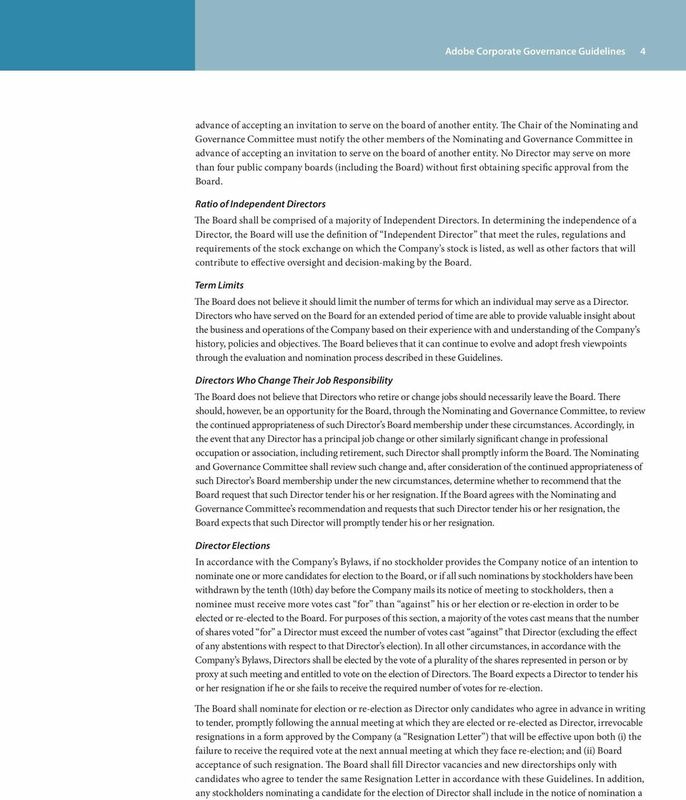 In determining whether to recommend acceptance or rejection of the tendered resignation, the Nominating and Governance Committee will consider all factors it deems relevant including, without limitation, (i) the stated reasons why stockholders voted against such Director; (ii) the Director s length of service and qualifications; (iii) the Director s contributions to the Company; (iv) compliance with listing standards; and (v) these Guidelines. The Board will act on the Nominating and Governance Committee s recommendation not later than 90 days following the date of the stockholders meeting at which the election occurred. In deciding whether to accept the tendered resignation, the Board will consider the factors considered by the Nominating and Governance Committee and any additional information and factors the Board believes to be relevant. Promptly following the Board s decision, the Company will disclose that decision in a filing with the Securities and Exchange Commission, a press release or other broadly disseminated means of communication. If the Board decides to accept the Director s resignation, the Nominating and Governance Committee will recommend to the Board whether to fill the resulting vacancy or to reduce the size of the Board. The Board expects the Director who tenders his or her resignation pursuant to these Guidelines to abstain from participating in the Nominating and Governance Committee recommendation and the Board s consideration whether to accept or reject the resignation. If a majority of the members of the Nominating and Governance Committee received a majority against vote at the same election, then the Independent Directors who did not receive a majority against vote will appoint a Board committee amongst themselves solely for the purpose of considering the tendered resignations and will recommend to the Board whether to accept or reject them. 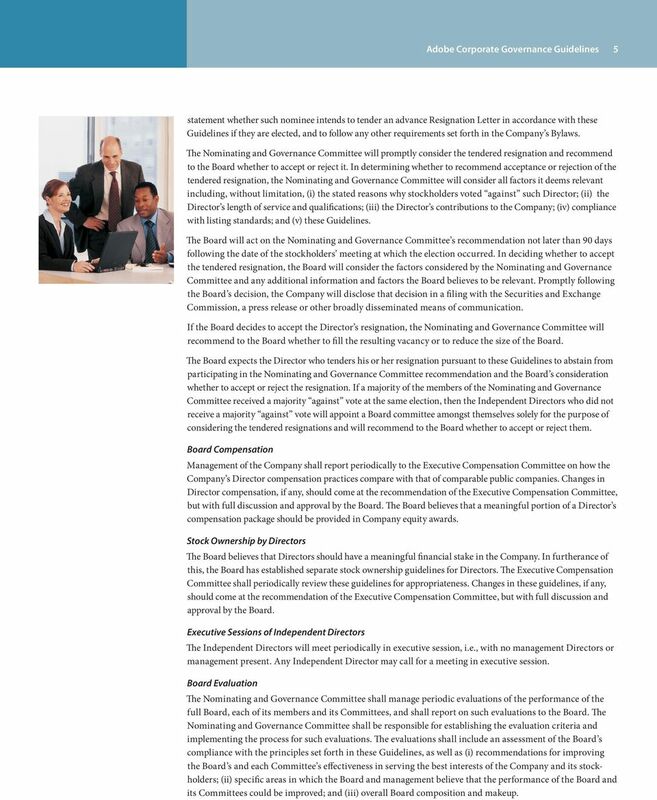 Board Compensation Management of the Company shall report periodically to the Executive Compensation Committee on how the Company s Director compensation practices compare with that of comparable public companies. Changes in Director compensation, if any, should come at the recommendation of the Executive Compensation Committee, but with full discussion and approval by the Board. The Board believes that a meaningful portion of a Director s compensation package should be provided in Company equity awards. Stock Ownership by Directors The Board believes that Directors should have a meaningful financial stake in the Company. In furtherance of this, the Board has established separate stock ownership guidelines for Directors. The Executive Compensation Committee shall periodically review these guidelines for appropriateness. Changes in these guidelines, if any, should come at the recommendation of the Executive Compensation Committee, but with full discussion and approval by the Board. Executive Sessions of Independent Directors The Independent Directors will meet periodically in executive session, i.e., with no management Directors or management present. Any Independent Director may call for a meeting in executive session. Board Evaluation The Nominating and Governance Committee shall manage periodic evaluations of the performance of the full Board, each of its members and its Committees, and shall report on such evaluations to the Board. The Nominating and Governance Committee shall be responsible for establishing the evaluation criteria and implementing the process for such evaluations. 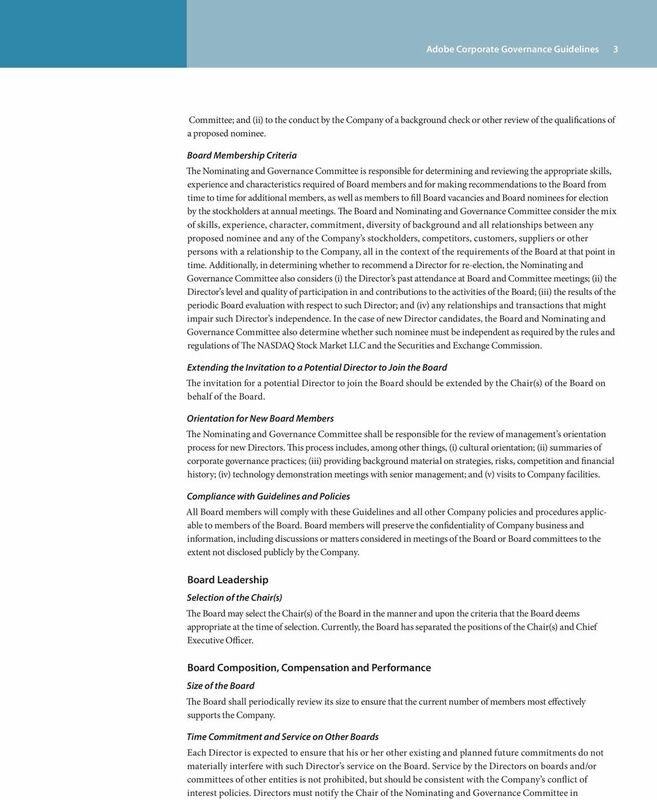 The evaluations shall include an assessment of the Board s compliance with the principles set forth in these Guidelines, as well as (i) recommendations for improving the Board s and each Committee s effectiveness in serving the best interests of the Company and its stockholders; (ii) specific areas in which the Board and management believe that the performance of the Board and its Committees could be improved; and (iii) overall Board composition and makeup. 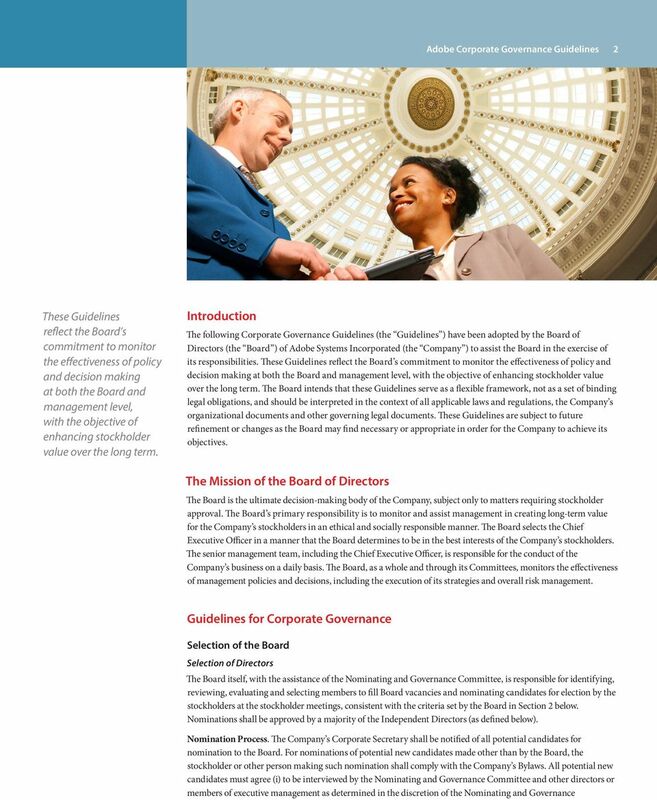 6 Adobe Corporate Governance Guidelines 6 Director Education The Nominating and Governance Committee shall have oversight over continuing education for Directors. Directors are encouraged to participate in continuing education programs, the costs of which the Company will reimburse, in order to maintain the necessary level of expertise to perform their responsibilities as Directors. Board Meetings; Involvement of Management; Outside Advisors Frequency of Meetings There shall be at least four regularly scheduled meetings of the Board each year. The Board will hold additional meetings as needed. Board members are expected to participate in meetings of the Board and of Committees on which they serve. Additionally, members of the Board are encouraged to attend stockholder meetings. Selection of Agenda Items for Board Meetings The Chair(s) of the Board, taking into account suggestions from other members of the Board, will establish the agenda for each Board meeting. If the Chair(s) is not also the Chief Executive Officer, the Chair(s) shall consult with the Chief Executive Officer and other members of executive management regarding the agenda. Each Board member is free to suggest the inclusion of item(s) on the agenda and to raise at any Board meeting item(s) that are not on the agenda but are appropriate for discussion at such meeting. 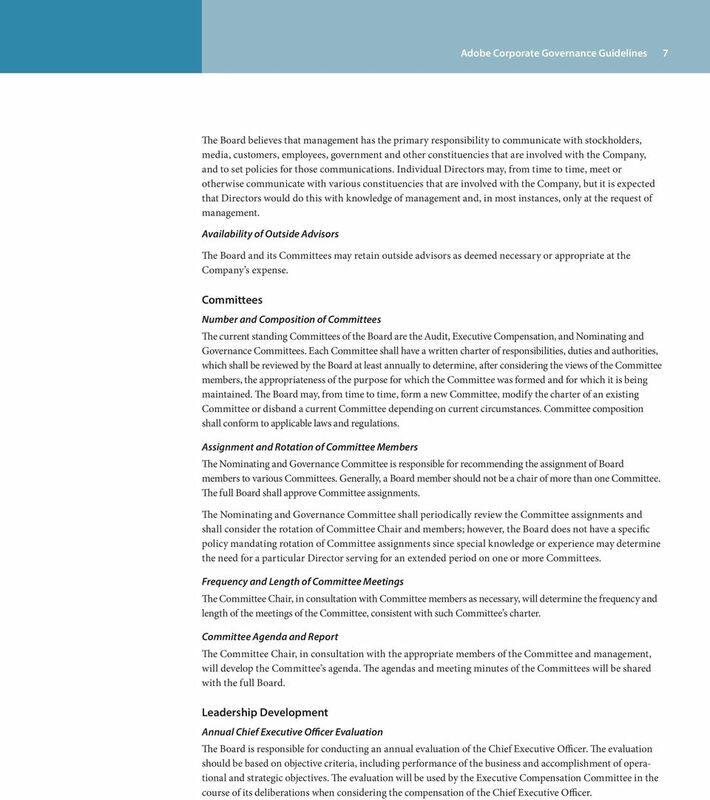 The Board believes that certain continuing oversight responsibilities should have priority on the agenda, taking into account the overall focus of preserving and increasing stockholder value, including review of Company strategy and performance, management oversight, overall risk management, ethical business practices, legal compliance, accounting and financial controls, financial structure, preservation of assets and Board effectiveness. Board Materials Distributed in Advance Information and data that is important to the Board s understanding of matters on the agenda should be distributed in writing or electronically to the Board in advance of the Board meetings. Committee materials shall be distributed to all Board members. Board members are expected to review meeting materials in advance of Board and Committee meetings. The Board acknowledges that sensitive subject matters may be discussed at the Board meeting without written materials being distributed in advance or at the meeting. Board Access to Management Board members shall be afforded unrestricted access to the Company s management. Board members shall use their business judgment to be sure that this contact is not unduly distracting to the business operations of the Company. The Board may specify a protocol for making such inquiries. The Board welcomes the regular attendance at each Board meeting of selected members of management as invited by the Chair(s). Should the Chief Executive Officer want to add additional people as attendees on a regular basis, it is expected that this suggestion would be made to the Board for its concurrence. 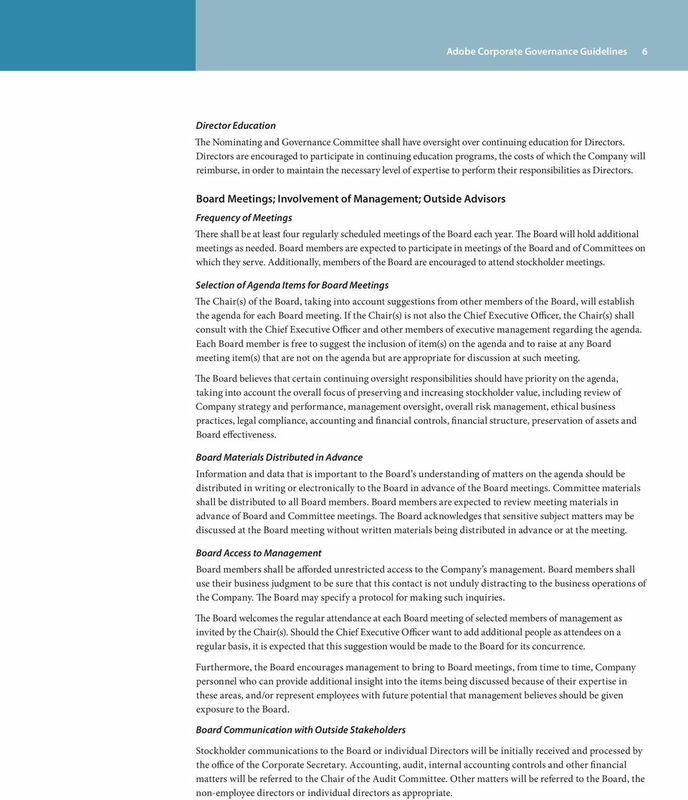 Furthermore, the Board encourages management to bring to Board meetings, from time to time, Company personnel who can provide additional insight into the items being discussed because of their expertise in these areas, and/or represent employees with future potential that management believes should be given exposure to the Board. Board Communication with Outside Stakeholders Stockholder communications to the Board or individual Directors will be initially received and processed by the office of the Corporate Secretary. Accounting, audit, internal accounting controls and other financial matters will be referred to the Chair of the Audit Committee. Other matters will be referred to the Board, the non-employee directors or individual directors as appropriate. 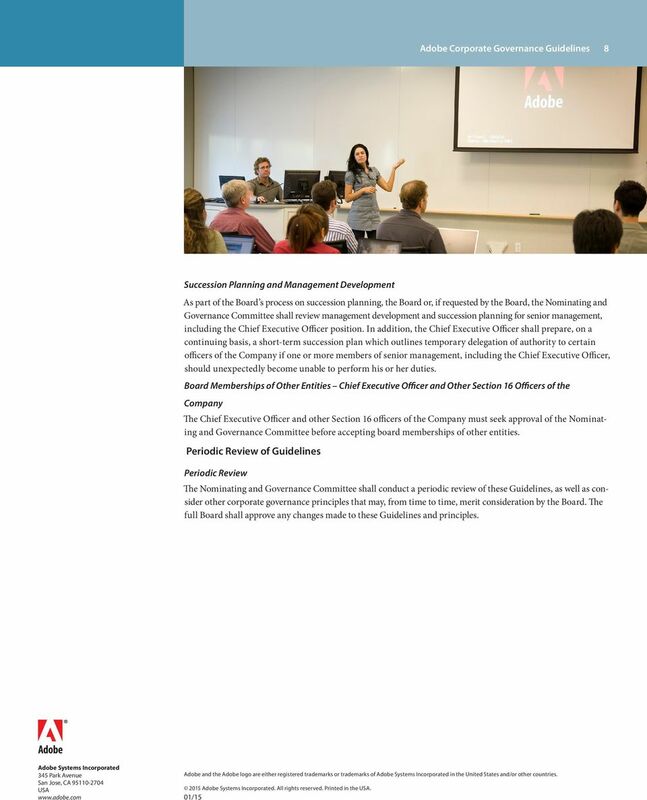 7 Adobe Corporate Governance Guidelines 7 The Board believes that management has the primary responsibility to communicate with stockholders, media, customers, employees, government and other constituencies that are involved with the Company, and to set policies for those communications. Individual Directors may, from time to time, meet or otherwise communicate with various constituencies that are involved with the Company, but it is expected that Directors would do this with knowledge of management and, in most instances, only at the request of management. Availability of Outside Advisors The Board and its Committees may retain outside advisors as deemed necessary or appropriate at the Company s expense. Committees Number and Composition of Committees The current standing Committees of the Board are the Audit, Executive Compensation, and Nominating and Governance Committees. Each Committee shall have a written charter of responsibilities, duties and authorities, which shall be reviewed by the Board at least annually to determine, after considering the views of the Committee members, the appropriateness of the purpose for which the Committee was formed and for which it is being maintained. The Board may, from time to time, form a new Committee, modify the charter of an existing Committee or disband a current Committee depending on current circumstances. Committee composition shall conform to applicable laws and regulations. Assignment and Rotation of Committee Members The Nominating and Governance Committee is responsible for recommending the assignment of Board members to various Committees. Generally, a Board member should not be a chair of more than one Committee. The full Board shall approve Committee assignments. The Nominating and Governance Committee shall periodically review the Committee assignments and shall consider the rotation of Committee Chair and members; however, the Board does not have a specific policy mandating rotation of Committee assignments since special knowledge or experience may determine the need for a particular Director serving for an extended period on one or more Committees. Frequency and Length of Committee Meetings The Committee Chair, in consultation with Committee members as necessary, will determine the frequency and length of the meetings of the Committee, consistent with such Committee s charter. Committee Agenda and Report The Committee Chair, in consultation with the appropriate members of the Committee and management, will develop the Committee s agenda. The agendas and meeting minutes of the Committees will be shared with the full Board. Leadership Development Annual Chief Executive Officer Evaluation The Board is responsible for conducting an annual evaluation of the Chief Executive Officer. The evaluation should be based on objective criteria, including performance of the business and accomplishment of operational and strategic objectives. The evaluation will be used by the Executive Compensation Committee in the course of its deliberations when considering the compensation of the Chief Executive Officer. Corporate Governance Guidelines of IMS Health Holdings, Inc.
Corporate Governance Guidelines of Trinseo S.A.